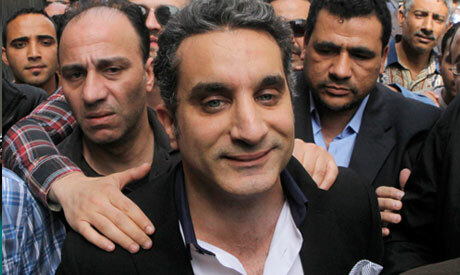 Prosecutors released Bassem Youssef on LE15,000 ($2,142) bail on Sunday afternoon. Youssef said the decision to release him was based on investigations into three of the lawsuits filed against him. "There is a forth lawsuit remaining and the time for investigations into it has not been set," Youssef said via Twitter immediately following his release. Earlier on Sunday, the renowned TV satirist arrived at Egypt's High Court in response to an arrest warrant submitted by the country's top prosecutor. The prosecutor-general had ordered Youssef’s arrest on Saturday after a number of complaints were made against him for allegedly insulting President Mohamed Morsi, denigrating Islam and spreading false news with the aim of disrupting public order. Dozens of supporters of Bassem Youssef rallied outside the office of the prosecutor-general in solidarity with the one-time physician turned satirist. The complaints were filed by 12 people after Youssef's 1 March episode in which he mocked the president's interview with TV anchor Amr El-Leithy in February. In January, a number of Islamist lawyers filed a separate lawsuit against Youssef for "undermining the standing of the president" during his show but the charges were dropped before the case reached court. 13-4-13 This satirist and his supporters are products of the West`s intentional or non-intentional brainwashing via Internet. The West is acting against the first law of the animal world which says: "the nest is sacred, and intruders will be attacked". It is intruding Arab homes and educating other people`s children. Saudi rulers therefor are thinking of blocking websites, which is the least they should do but only if they block everything but Islamic sites, even Google. All Islamic countries like Egypt, should follow in order to have a chance of putting the young back on the Islam track. I am a Westerner but I confess my opinion that Prophet Mohammed did a better job than Jesus Christ after all. Speak out. Which could have another turn in his country. A very brave man. Freedom of speech doesn't mean freedom defamation and vulgarity. Is that the way the MBH will collect mony to improve the Egyptian econmy that they reuined since they ruled the country?